Our process begins with a consultation meeting to determine the needs and expectations of the client. A “wish-list” is created that will be used as the guide during the preliminary design phase of the project, whether it ranges from a wall of millmade cabinetry to the design of a complete custom home. Once conceptual plans are created, meetings are scheduled to review and discuss the design. Our objective for the preliminary design process is to transform the “wish list” into a design that is one step closer to turning the vision into reality. Once the preliminary design drawings are approved, the construction document phase of the project will proceed. This process will then transform the conceptual design into a detailed set of construction documents. 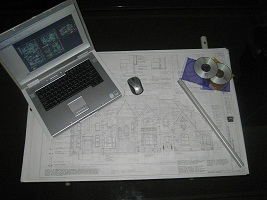 These drawings will provide the necessary information for construction and obtaining building permits. Meetings with the client are scheduled to select building materials that will be used for the project and specified on the drawings.. This process will take the preliminary design drawings to the next level and closer to turning the vision into reality. 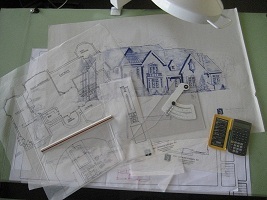 The final drawings provide the information necessary for your builder to begin the construction phase of the project. Our 2-dimensional drawings will come to life as the design begins to take shape. Consultation meetings and visits are scheduled to view the construction process, as needed. Interior Design services are also provided at this phase of the project to achieve the final look, when requested.